Found a home in a dining room in Cambridge, MA. 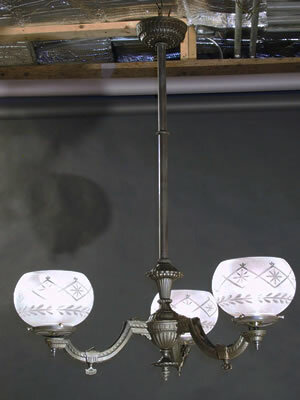 This 3 Light Renaissance Revival Gas fixture has a super bronze patina on Cast Iron and measures 30" diameter and 38" long. With very high quality cut glass shades it lit a Dining room in the 1870's and would be a great light for a Dining room or large Foyer in the 2000's as well. It has a laid back level of ornateness compared to some of the Renaissance Revival fixtures.